After the All Progressives Congress (APC) asked security agencies in the country to probe the strategy meetings of the leaders of the Peoples Democratic Party (PDP) held in Dubai, United Arab Emirates, alleging that they have sinister agenda, PDP Chiefs, Fani Kayode and Ben Bruce have now reacted. 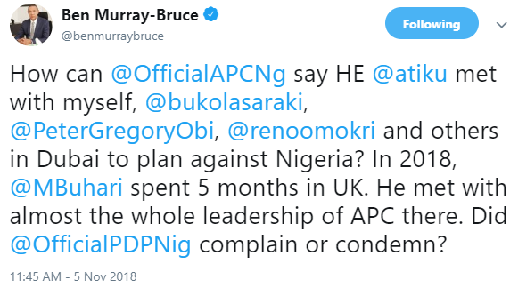 Ben Brice says, when President Buhari was in London, he met with almost the whole leadership of APC there and opposition party, PDP never complained or condermed it. While FFK simply called the probe madness. 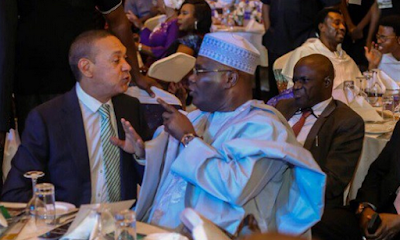 ''How can @OfficialAPCNg say HE @atiku met with myself, @bukolasaraki, @PeterGregoryObi, @renoomokri and others in Dubai to plan against Nigeria? In 2018, @MBuhari spent 5 months in UK. He met with almost the whole leadership of APC there. Did @OfficialPDPNig complain or condemn? '', Ben Bruce wrote on twitter. ''The flagbearer of the opposition party travels to Dubai for a rest and to meet with other party leaders for a discussion about the way forward. The reaction of the ruling party is to call on the security agencies to probe all those that attended the meetng. Is this not madness? '', FFK also wrote separately on his twitter page. 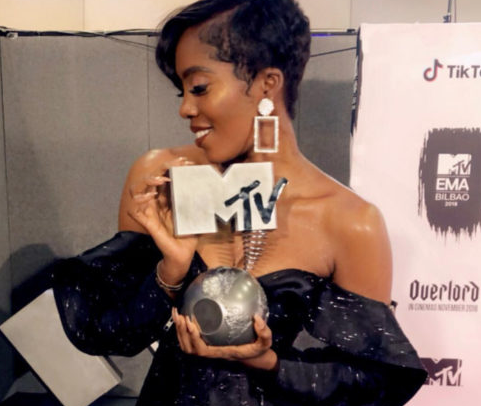 Tiwa Savage Afro-pop singer snatched the record-breaking award at the 2018 MTV EMAs held on Sunday at the Bilbao Exhibition Center, Bilbao, Spain with several music stars across the world in attendance. The African act category, in 2005, was infused into the MTV EMA to enhance musical alliances across borders, and promote cultural integrations. NAN reports that until Tiwa’s win, three Nigerians had taken the award home including 2Baba in 2005, D’banj in 2007 and 2012; and Davido in 2017. In 2018, Tiwa was nominated alongside fellow Nigerian act, David Adeleke, aka Davido; South Africa’s Distruction Boyz and Shekinah; Kenya’s Nyashinski and Fally Ipupa from the DRC. The deceased identified as Mukoro Ovie aka Close Betting had run away to the town hall after his mother reportedly took him to a church in the community for prayers over his strange behaviour. Atiku's reaction follows a recent promise made by president Buhari to donate $500,000 to Guinea Bissau, along with other materials. Presidential candidate of the Peoples Democratic Party (PDP), Atiku Abubakar, has called on President Muhammadu Buhari to attend to the needs of Nigerians instead of donating money to other countries. In a statement released by his media team on Sunday, November 4, 2018, Atiku urged president Buhari and his cabinet to be more prudent witg the nation's resources. "Our response is to ask why a nation that has been officially named as the world headquarters of extreme poverty, will donate her resources to others instead of using them to solve pressing domestic problems? "This is the same government that is so cash-strapped that it has so far borrowed N13tn in three years" he said. He asked, "How prudent is it to go about taking loans from whosoever cares and then turn around to give out the money when your own people are suffering the worst form of poverty? "We call on the Muhammadu Buhari administration to cut its coat according to its cloth. He should stop donating like Father Christmas. He should attend to the need of Nigerians” he added. Atiku also stressed that there is no way he would pretend to be unconcerned with the way president Buhari is running the country having been part of the government that paid off Nigeria's foreign debts in the past. The PDP presidential candidate will be flying the flags of the party along with for Anambra State governor, Peter Obi as his running mate in the 2019 presidential election scheduled for February 16, 2019. The APC NWC earliar cancelled the governorship primary election which was conducted on October 1, 2018 in Imo. Segun Agbaje the Resident Electoral Commissioner for Osun State was beaten to Coma by Angry Youths at the burial venue of Dr. Ibitoye. The beaten was inconclusive and adjourned to another time.